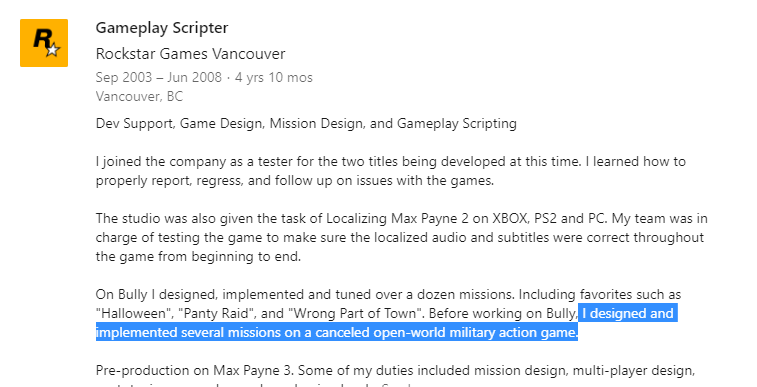 According to the resume of technical designer Matt Norman,Rockstar vancouver used to work on a canceled miitary game,or maybe it was agent? That would have been Spec-Ops. It was in development after Barking Dog had been bought by R*, Josh Homme from Queens of the Stone Age was gonna score it but then it was cancelled. He's right about Halloween and Wrong Part of Town, they were definitely fun af.